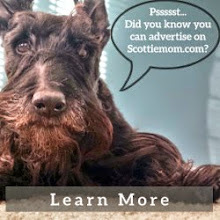 Sometimes, Scottie Mom has nothing but Scotties on the brain. People say she often walks the fine line between Scottie Love and Scottie Obsessed. Our friends at Merriam Webster say obsession is a persistent disturbing preoccupation with an often unreasonable idea or feeling...what about Scotties is disturbing or unreasonable? Nothing! Therefore, those people are overruled in this matter. Still, taking away any negative connotations that might come along with the word obsessed, I thought it might be fun to explore what would classify as Scottie Love and simultaneously, what would classify as Scottie Obsessed. In which category would you fit? - You don't want to remove the Scottie nose prints off the car window because you are convinced these are priceless works of art that will be worth something someday. - Sleep becomes optional because all you need is to have a Scottish Terrier or two to cuddle with at night. Who cares that they've taken over the human bed and that your leg may have lost feeling two hours ago? - You put off going to work in the morning and hurry home at night as nothing makes you happier than spending time with your Scottie(s). - Everything revolves around your Scottish Terrier(s). 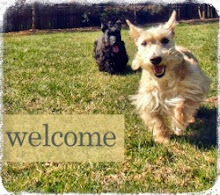 - You're greeted with the same wagging tail and happy face whether you've been gone all day or for just a few minutes. - Upon organizing your closet, you discover that you no longer own a single item of clothing that does not have a Scottie imprinted on it. - You ask the Scottie Dad in your life to grow a beard that closely resembles your Scottie dog's. - Slowly but surely all the dinnerware and glassware in your Scottie House is replaced with mismatching Scottie cups and plates that you're hesitant to use because they are too cute. - You name your child Scott, Scotty or some other variation of the name in honor of your Scottie dog. - The smell of a freshly groomed Scottish Terrier is more appealing to you than the scent of fresh flowers, baked goods and just about every other fan favorite smell on Earth. - Dreams of traveling back in time to the 1950s to squash the poodle skirt trend and replace it with a tartan Scottie skirt fashion phenomenon fill your mind. - You start speaking in ArRRrOo's...in public. This is normal, right? My peep is pretty obsessed with us. Scottie's are the best! 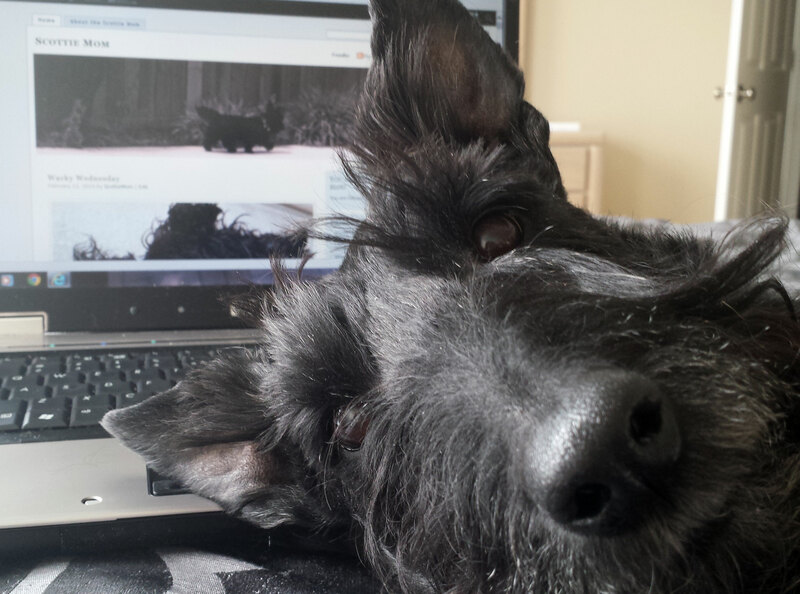 I absolutely know what you mean, I have my three Scottie's and Duncan is my very favourite Scottie in the world, hence my email address... I am totally obsessed with all my Scottie's and even have a "pocket Scottie", JoJo you've already met, she's a total lap dog to me. BOL....hmmmmmmmmm, there is a very thin line between love and obsession, isn't there?? Arooooooooo....! I passed the Scottie obsession test...I am 100% Scottie obsessed and I love it, love it, love it!! I am borderline obsessed. Definitely feeling the Scottie Love, though! You're obsessed if you own a ScottieMobile with a front license plate that has a picture of your Scottie on it. The back (state issued) plate says "AROO" and has a logo "Pets enrich our lives". Mom cannot stop laughing...because dada has grown a beard and she LOVES it!!!! and last but not least, my future biggest house project of all: MY GLASS KITCHEN DOOR with a cute and discrete Scottie design printed on it!!!! Youpiiii!! Hahaha. Well I love all of your example, and I can't help but think how wonderful being scottie obsessed sounds. Such fun! Having said that, I might just be justifying my own obsessive behavior... no need to tell anybody though! Love, obsessed whatever I'm one lucky scottie. Bwahaahaa! We think naming a son Scotty after the dogs might be a problem....but only if you have more sons!! Otherwise, we see no problem with your behaviour...seems natural to us. OMD that made us chuckle specially the bit about mismatched crockery. We are all a tad obsessed with our pets. Have a wonderful Wednesday. Well we gotta go with "Obsessed" here and no regrets. SCOTTIES RULE the world, well at least this home! My Scottie Dad laughed out loud when I told him the one about growing a Scottie beard. That man LOVES his "littles" the Scots but not as much as their mommy loves them. You say "obsessed" like its a bad word!